A﻿﻿s you may already know, I'm launching my first private labeled product in 2017 and I since this is the first time I'm going through the process, I figured you guys might want to follow along. Private labeling a product is where you buy a product already being manufactured, brand it, and sell it under your own label/company. You don't need to invent anything new and you don't have to start manufacturing a never before seen product, you simply slap your brand name on a product already created and sell it. For example, if I wanted to private label a spatula, I would find a manufacturer (likely in China) selling spatulas for pennies on the dollar, then I'd have them brand them with my company and ship them in to sell. Now, that isn't to say that you can't change things about your private labeled product. In fact, it's suggested that you do change things about the product to make it competitive and worthwhile to a buyer. After all, if you start selling a spatula that's the same as 50 other brand's spatulas, you likely won't sell any unless you're priced significantly lower. And in that situation, you probably won't be able to price any less than your competition, because you're all probably getting them from the same manufacturers. So, how do you stand out from the competition? You change your product slightly to appeal to what buyer's want. If a buyer wants a sturdier or longer handle on their spatulas, you do that. If they want the spatula in a different color, you change that. You don't need to drastically change the design or function, you simply need to appeal to your buyers. I'll talk more about this in a later module though. This is arguably the most important part of the process - finding a good product to sell. If you don't find a good product, you're almost guaranteed to fail. There are a lot of manufacturers and suppliers out there, so you need to find one that produces quality products at affordable prices. A sample is extremely important to make sure the quality is up to snuff and everything is exactly as you want it. Ideally, you should only buy enough to test the market and ensure your product will sell, but you're supplier may have an MOQ that requires you buy a lot to start. Now that you have your product, you want to list it and get it to Amazon ASAP. After all, you can't make money unless it's in their warehouse. Launching a brand new product is really challenging. I should know, as I've never done it before ;)... But, really getting [good] reviews is the gateway to getting more sales of your product and Amazon has made it quite challenging to get reviews nowadays since you can no longer give your product away (or sell it at a discount) in return for a review. As long as everything went well, you can repeat this process on a new product! Obviously, this is a very dumbed down version of the PL process, but you get the idea. I'll be going more in depth as I continue this case study. You may be thinking, "What qualifications does this guy have that he can tell me how to private label?" Honestly, I have none. I've never private labeled a product nor have I ever manufactured a product, so this case study may be a big failure. But, and that's a big BUT, it'll be me that fails and not you. By following along with this case study, you'll hopefully learn from my successes and failures without having spent a penny! So, follow along or don't - the choice is yours. At this point, I've already ordered my second product sample, as the first didn't quite meet the standards I was looking for. I'll hopefully have the second sample sometime in mid March. Since my product is coming from Asia and it takes time for my manufacturer to make my product, I'm now playing the waiting game. But, that's actually a good thing, because it gives me time to write up some more posts as to what I've done already. There are a lot of private label courses out there and most of them are quite expensive, like $1,000+ expensive, which I honestly think is wayyyy too much. 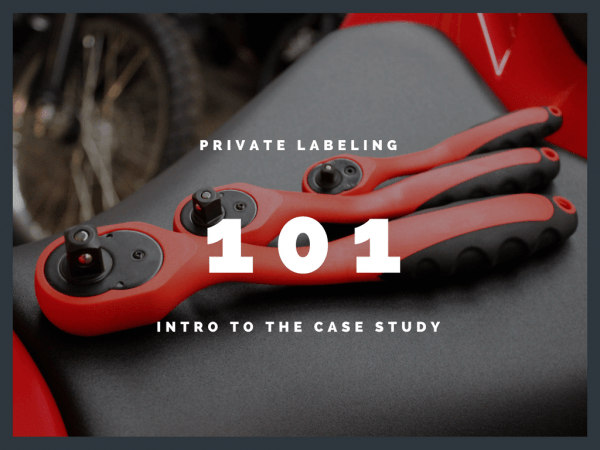 I've read A LOT about private labeling from experts, from newbies, and even from marketers, but the two resources I recommend most are Scott Voelker's, "﻿Amazon Selling Blueprint﻿" (affiliate) and Josh Shogren's PL Case Study​. Scott's book is $2.99 (or free for Kindle Unlimited Users), so it's a very small investment and it's chock full of great PL information. This ebook was one of my main inspirations to start my private labeling journey. Josh's case study, on the other hand, is a real live case study like the one I am doing now, where he researched a PL product, launched it, and wrote about his whole experiences. This case study is super in depth and worth a read if you're serious about PLing. Some of the strategies he uses are a bit old, mainly how he gets reviews, but there's still a lot of valuable info here. And to finish this post off, I'll you guys one question: What do you want to learn from this case study? I want to write this for you guys, so if you have a specific question in regards to PL, post it below and I'll do my best to answer it in this series!